Please refer to our stock # 1841 when inquiring. North to South: 5" x 2 1/4" wide *a two way facing bail. *The multi cultural ethnographic evil eye motif, used in jewelry by the ancient Romans, Asian Dzi, Victorian and continuously through out the middle east was hand shaped forged by this maker, with the antique 2 piece construction button as the iris. *Final dangle: using sterling silver to thread a 4mm genuine coral bead, hand twisted sterling and gold fill spacer then the glorious 9mm iridescent praline brown high nacre fresh water pearl. 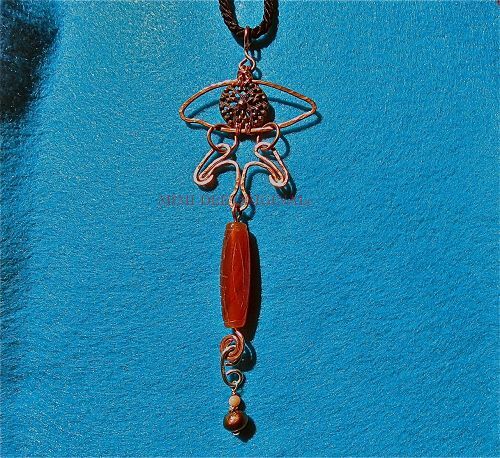 This signed studio metalwork jewelry artist who also paints oils / acrylics, has made fiber art to wear garments in the past and does not duplicate, has exhibited in various juried art shows, more recently since 1990 to present.